The kit can detect any surface marker proteins on extracellular vesicles (EVs) with high sensitivity by flow cytometry after capturing EVs by PS Affinity Method※1. Before use, it is necessary to prepare fluorescence-labeled primary antibody against exosome surface marker protein, or primary antibody and fluorescence-labeled secondary antibody. "A novel affinity-based method for the isolation of highly purified extracellular vesicles", W. Nakai, T. Yoshida, D. Diez, Y. Miyatake, T. Nishibu, N. Imawaka, K. Naruse, Y. Sadamura ＆ R. Hanayama, Sci Rep 6, 33935 (2016). Exosomes in cell culture supernatant of K562 cells were isolated using PS Capture™ Exosome Flow Cytometry Kit or each of anti-CD81-, CD9- and CD63-antibody-immobilized magnetic beads (supplier A), followed by flow cytometric analysis of exosome surface antigens after immunostaining with fluorescence-labeled antibodies. Each signal value was normalized using the value of Isotype. It was confirmed that the PS Capture™ Exosome FCM Kit can detect the exosome surface antigen with high sensitivity compared with competitors' products, regardless of which detection antibody is used. Exosomes in human serum and human plasma (EDTA plasma, heparin plasma) were isolated using PS Capture™ Exosome Flow Cytometry Kit, followed by flow cytometric analysis of exosome surface antigens after immunostaining with PE-labeled mouse IgG isotype control and PE-labeled anti-human CD9 antibody. In any of the samples, the peak shift of fluorescence intensity was confirmed when stained with PE-labeled anti-human CD9 antibody. 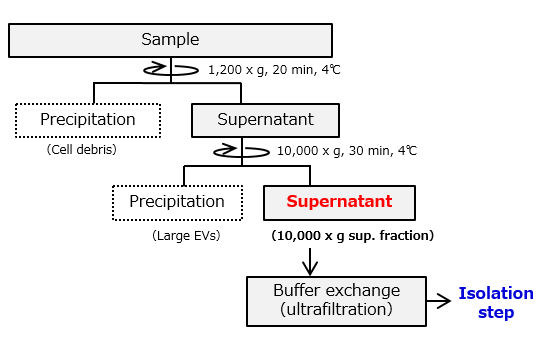 Perform buffer exchange of 1 mL centrifuged EDTA plasma sample with 50 mL of TBS buffer. Add 19 mL of TBS to Vivaspin20 (100K). Add the 1 mL of centrifuged EDTA plasma sup. to the Vivaspin20 (100K) of 1. and mix (solution A). Add 10 mL of TBS to solution A when the upper liquid volume is dropped (solution B). 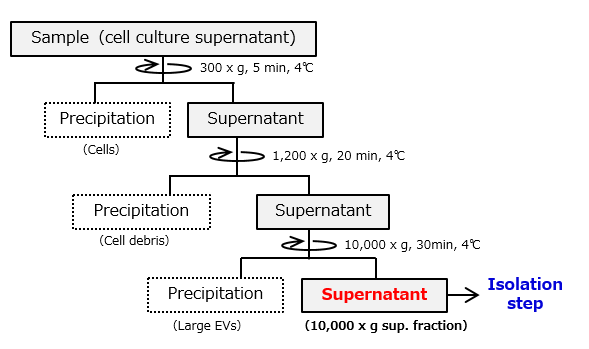 Centrifuge solution B at 4°C. Add 10 mL of TBS to solution B when the upper liquid volume is dropped (solution C). Centrifuge solution C at 4°C. Add 11 mL of TBS to solution C when the upper liquid volume is dropped. 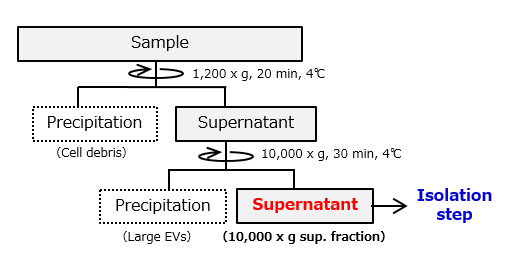 Centrifuge solution C at 4°C until the volume becomes under 1 mL. In the case of EDTA plasma samples, EDTA inhibits the interaction between EVs and Exosome Capture Beads, thus please perform the buffer exchange beforehand. Vivaspin20 M.W. cut off: 100K (Sartorius, VS2041) and 50 mL of TBS are required. 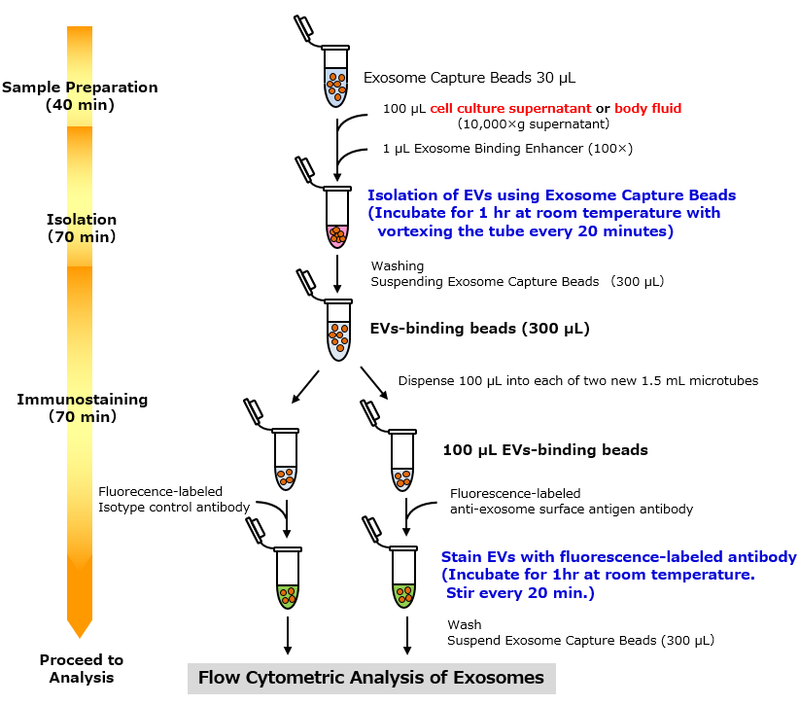 Basic protocol is set as 2 reactions using a 1.5 mL microcentrifuge tube to isolate EVs from samples with Exosome Capture Beads. For scale-up, increase the amount of Exosome Capture Beads and samples. 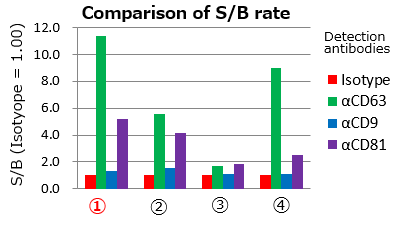 Recommended reaction scale is presented in the right table. Note: 10 reactions are maximum for one 1.5 mL microcentrifuge tube. Product content may differ from the actual image due to minor specification changes etc.